Is there anything worse than jumping in an ice-cold shower first thing in the morning? When your water heater isn’t working like it should, a trusted plumber in Victor NY can help! We’re proud to offer dependable water heater repair in Victor NY and the surrounding areas, and we’d be happy to help with your water heater woes. At GT Campbell Plumbing, we service and install several types of water heaters. Whether you need to have your existing heater fixed or you’re thinking about upgrading to a newer, more energy efficient model, we do it all. A lack of hot water is, of course, the most obvious sign that you’re in need of water heater repair, but there are a few things to watch out for before the problem becomes that severe. If your water is taking longer to heat up or isn’t getting as warm as usual, it could be a sign that your water heater is failing. Also, watch out for water with an unusual color, smell or taste, and listen for unusual sounds. Water heaters are built to last for several years, but even top-of-the-line models need to be replaced eventually. If you have a traditional tank-style heater that’s 8 to 10 years old, you may want to consider replacing it with a newer model. Tankless water heaters generally last about 20 years. If your water heater is nearing the end of its lifespan, upgrading to a new model may be a better investment. 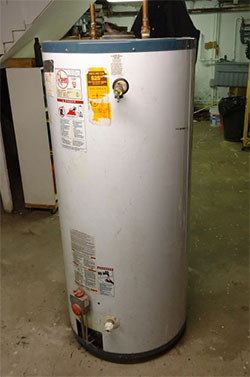 At GT Campbell Plumbing, we are proud to offer the best water heater repair in Victor NY. We hire only the best plumbers in Victor, and we make sure they have the knowledge, tools and equipment to get the job done the first time, every time. Our services are fast and affordable, and we have earned the trust of countless homeowners in the Victor area.